Pasquale, Esposito, Italian Tenor and star of PBS television specials on Enrico Caruso and Italian Piazzas and Tammy Nelson, star oBeach Blanket Babylon will headline the cast of San Jose Musical Theater’s salute to the movies, “Hooray for “Hollywood”, musical theater back to San Jose is the third that San Jose Musical Theater has presented and precedes their production of Always, Patsy Cline to be presented in April/May at Gordon Biersch Brewery and Restaurant in San Jose. Mr. Esposito and Ms. Nelson will join a cast of twenty doing a cavalcade of music from the movies singing favorites such as The Way You Look Tonight, The Shadow of Your Smile, As Time Goes By, The Way We Were, Somewhere Over the Rainbow and many more. Among those singing will be local favorites, James Creer, Beverly Blount, Kevin Cornelius, Karen DeHart, Greg Goebel, Sarah Griner, Neil MacPherson, Mary Melnick, Nick Nakashima, Burr Nissen, Mindy Pedlar, Sheila Savage, Laura Stanford, Paula Warren and Judy West. Special Guests will include Bob and Kathy Russell flying in from Atlanta, Georgia. Singing and dancing to numbers such as “Singin’ in the Rain” will be Dean Scott. Musical director will be Neil MacPherson and the producer is Lucy Haab. 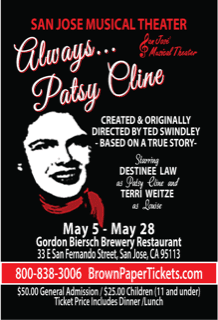 Director, C. Michael Traw will host with stories and trivia about the movies, their stars and the songs which helped make them great. 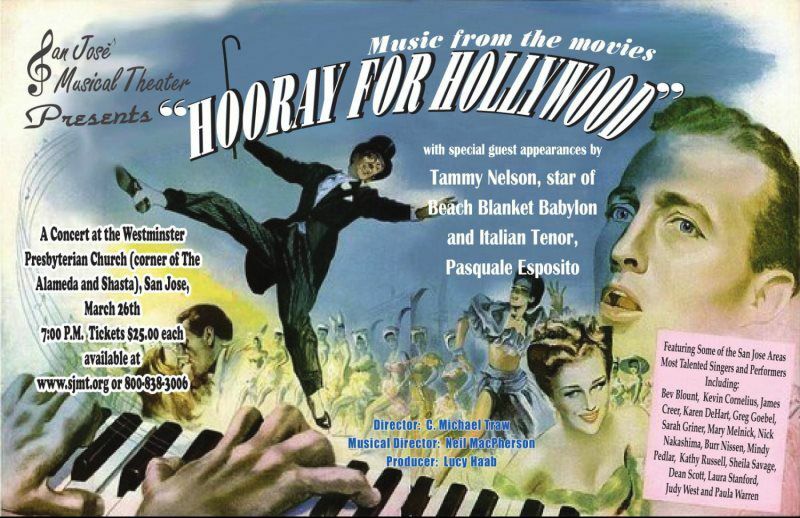 Tributes will be given to Gene Kelly, Fred Astaire, Judy Garland, Betty Hutton, Jane Powell, June Allyson with special recognition given to Debbie Reynolds.l be Neil MacPherson and the producer is Lucy Haab. Director, C. Michael Traw will host with stories and trivia about the movies, their stars and the songs which helped make them great. Tributes will be given to Gene Kelly, Fred Astaire, Judy Garland, Betty Hutton, Jane Powell, June Allyson with special recognition given to Debbie Reynolds. Come and be transported back to the “radio days” of 1942 as San Jose Musical Theater, sponsored by Evergreen Valley College, presents a favorite Broadway Musical, The 1940s Radio Hour. The scene is December 1942 and Radio Station WOV is about to air its final broadcast of the year from the Algonquin Room of New York’ Hotel Astor. The spirit of that bygone era when the world was at war is the setting for this timeless play filled with classic tunes presented by the Zoot Doubleman Swing Band such as I’ve Got a Gal in Kalamazoo, Our Love is Here to Stay, That Old Black Magic, Ain’t She Sweet, Blue Moon, I’ll Never Smile Again, Boogie Woogie Bugle Boy, I Got It Bad and That Ain’t Good, Have Yourself a Merry Little Christmas, I’ll Be Seeing You and many more. Participating as the radio audience of the 40s bygone days of the past, you’ll get to see the dance numbers, comedy routines, commercials, sound effects and a beloved cast of characters singing the hit music of the times. And, behind the scenes at the Radio Station, you’ll see a harassed producer coping with a drinking lead singer, the delivery boy who wants a chance in front of the mike, the second banana who dreams of singing a ballad, the classy and sassy cabaret singer, the overworked sound effects' person, and the trumpet playing orchestra member who chooses a fighter plane over Glen Miller. Presented by the Award Winning staff of Director, C. Michael Traw, Producer, Lucy Haab, Musical Director, Jesse Sanchez and Choreographer, Elizabeth Cox, the cast features, Nicky Nakashima* (who appears by courtesy of the Actors Equity Association), Gary Beytin, Sarah Griner, Dane Lenz, Brennah Kemmerly, Leslie Ivy, Alysia Beltran, Ron Houk and James Snell. 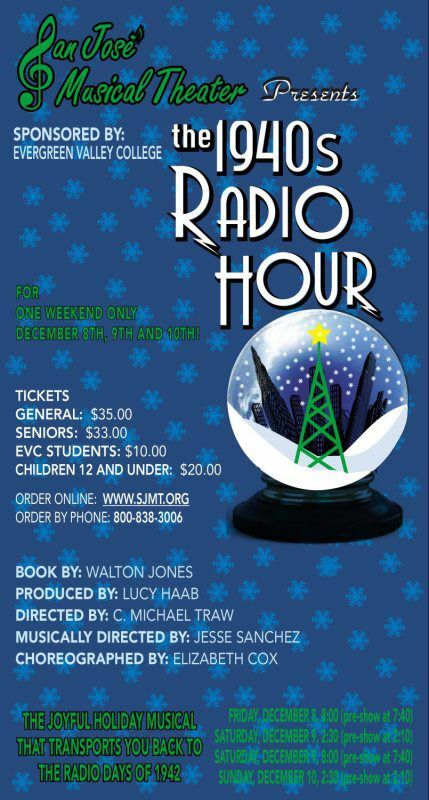 The 1940s Radio Hour plays for 4-performances only at Evergreen Valley College Theater with 2 evening and 2 matinee performances between December 8th and December 10th. If you like, wear your favorite 1940s clothing on Opening Night December 8th and go to the USO table in the lobby to receive a free 40s favorite treat, a Moon Pie.